Phyllis and Jim Rogers of Newnan recently honored the University of West Georgia with the endowment of a scholarship for a UWG Newnan student as well as a monetary gift for the purchase of educational nursing equipment at the Coweta campus. UWG Newnan patrons Phyllis and Jim Rogers (seated) recently donated funds for equipment for the nursing program as well as an endowed scholarship for a UWG Newnan nursing student. They are pictured with, standing from left, UWG Vice President of University Advancement Dave Fraboni, School of Nursing Dean Dr. Jenny Schuessler, UWG Newnan Senior Director Dr. Bob Heaberlin, UWG Newnan Director Cathy Wright, UWG Newnan Assistant Director of Development Elizabeth Jennette, Associate Dean of the College of Science and Mathematics Dr. Gregory Payne, and College of Science and Mathematics Professor Dr. Christopher Tabit. The scholarship will be awarded annually to a UWG Newnan nursing student who has a 2.5 GPA or higher and demonstrates unmet financial need. The endowment will be known as the Phyllis and Jim Rogers Nursing Scholarship Fund. Phyllis Rogers, who worked in the former Newnan Hospital (now housing UWG Newnan) as a registered nurse, said she knows how difficult it can be to obtain an education. Phyllis started a nursing career after 15 years of teaching art. However, she decided to start a second career in nursing, which she saw to fruition at the Newnan Hospital, primarily in the intensive care unit and emergency room. It was this training and experience that instilled in her admiration and respect for the knowledge and effort that is required for this profession and its importance in today’s healthcare. “This was my second career, so I know the need we have for smart, quick-action nurses,” Phyllis said. The Rogers’ gift will also help those aspiring nurses when they reach the classroom, as their gift will be used for facility enhancements at UWG Newnan. 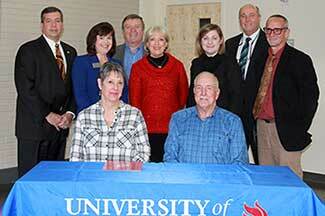 As a token of thanks, UWG Newnan’s General Science Lab will be named in honor of Phyllis and Jim Rogers’ mothers. Vice President for University Advancement Dave Fraboni assured that this would be the case and noted how appropriate it was to have such an advanced, accessible center for nursing education in a former hospital. UWG Newnan Senior Director Bob Heaberlin, Ed.D., was on hand for the signing and said it is the efforts of citizens like Phyllis and Jim that has made UWG Newnan able to grow and will help it expand in the future. “We’re very thankful for the Rogers’ generosity and their willingness to give back to their community through education,” Dr. Heaberlin said.